This volume is a retrospective of the work of artist Ed Colker (b. 1927). The book was designed by Colker to accompany an exhibition organized by the Museum of Art, University of Arizona in 1998 (reviewed by the NY Times HERE). Ed Colker is a printmaker, poet and academic who has worked in Chicago, Philadelphia, and New York. He now lives in Westchester County New York state. In 1960, Colker founded a not-for-profit fine art press to publish fine art limited edition books in response to poetry and with poets (more HERE and HERE). After high school, Colker was awarded a scholarship and began his art education at the Pennsylvania Museum School of Industrial Arts. He interrupted his studies to serve in the U.S. Army (1944-1946). He graduated in 1949, by which time the school had become the Philadelphia Museum School of Art; today it is the University of the Arts. He taught art in the Philadelphia area before moving to New York City in 1956. Later, Colker earned degrees from New York University (B.S. Ed, 1964; M.A., 1985). Colker taught art and design courses at the University of Pennsylvania, University of Illinois at Chicago Circle, Cornell University, Pratt Institute, and Philadelphia College of Art. By the 1980s, he had become an administrator as well as a professor. Throughout his academic career, Colker published and lectured widely, served as a visiting artist, acted as a consultant, and participated in professional organizations. He occasionally organized exhibitions and served on exhibition juries. Since 1960, under the imprints Editions du Grenier, Haybarn Editions, and Haybarn Press, Colker has published limited edition books, portfolios, broadsides, individual pages, and folders of poetry. Most are accompanied by Colker's etchings and lithographs inspired by the texts. Haybarn Press, under the Ambor Edition imprint, also produced four portfolios with text and drawings by Elaine Galen, 1996-2008. From its inception, the work of Haybarn Press has been featured in many exhibitions of book arts. Colker also participated in group shows throughout the United States and enjoyed solo exhibitions of his paintings and prints. Haybarn Press productions and Colker?s prints and paintings are in the permanent collections of Brown University, Cornell University, Harvard University, Library of Congress, Museum of Modern Art, New York Public Library, University of Arizona Museum of Art, and others. Now retired from university administration and teaching, Colker continues to operate Haybarn Press and occasionally serves as an exhibition juror and visiting artist. 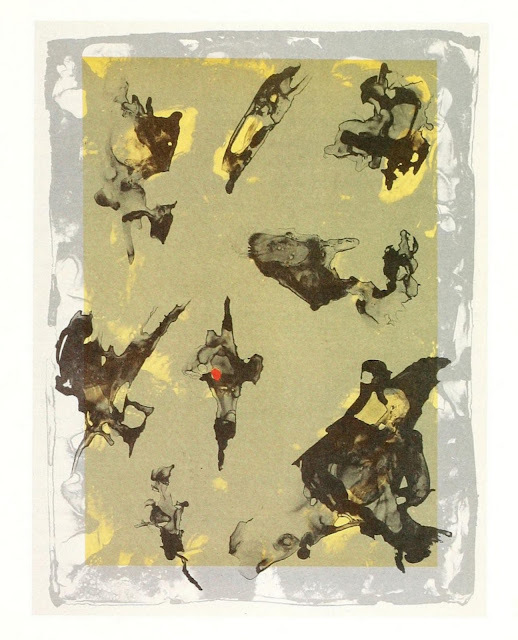 The image below is an offset lithograph from 1997 called Eight Ideas. The book is HERE. It was kindly made available by the artist underCC BY-NC-ND 3.0 terms.